Between them, these events provided a great kick-off for the US-wide “speaker series” project that Williams is working on with Just World Educational, under the title “The US, the United Nations, and the World”. More details of the project can be found here. The set-up at the bookstore event. UN Dept. of Public Information official Maher Nasser is at left, introducing. Williams and Krishna are presenting. At right, the camera the DPI was using for livestreaming. 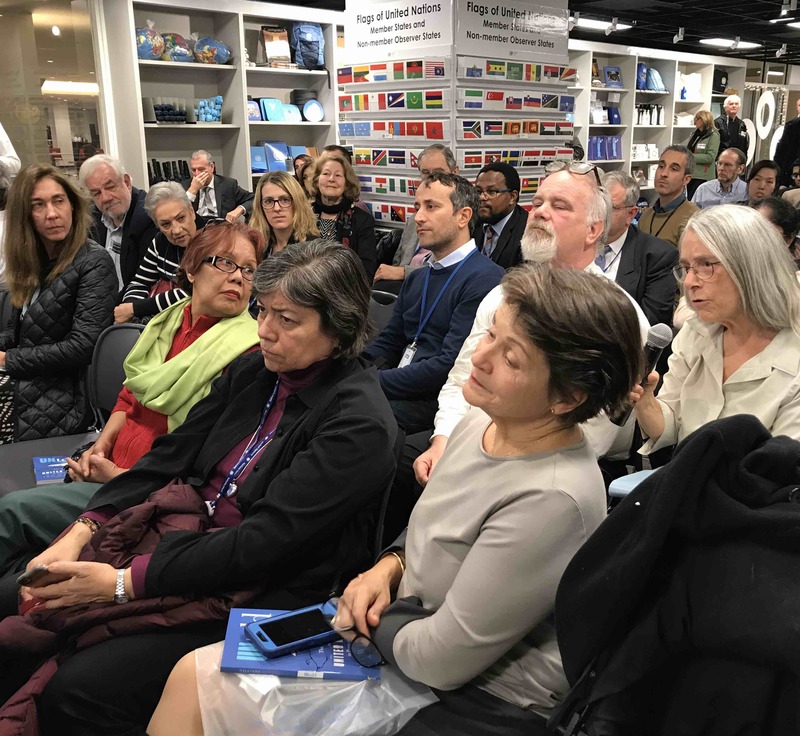 The UN Bookstore event attracted a great crowd, who filled out its event space, engaged in a lively discussion with the authors, and lined up eagerly afterwards to get their copies of the book signed! The event was also livestreamed on Facebook by the UN Publications staff. The archived version– which is both engaging and highly informative– can be viewed here. 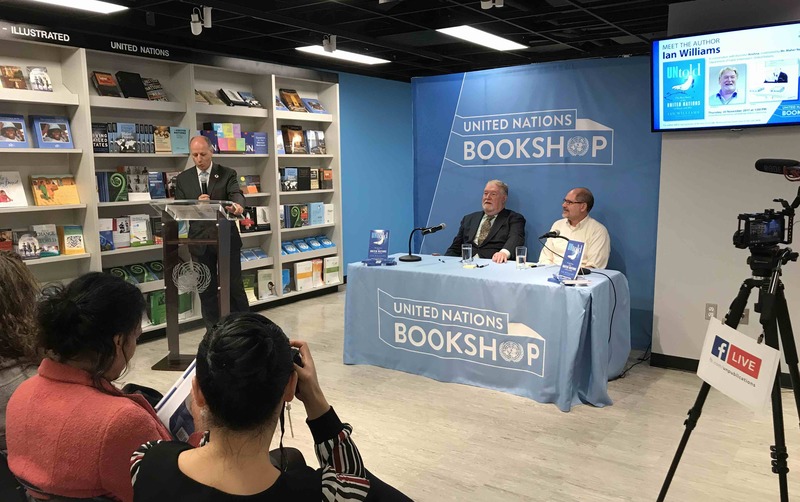 During this launch event, Williams shared numerous anecdotes from his nearly 30 years as a close UN watcher– and from the research into UN history that also went into the book. He argued passionately that publics and media representatives from around the world should pay much closer attention to what their own governments are doing at the UN and its affiliated agencies, since very often they cut deals that, once exposed and understood, can often look extremely dodgy. Some of the crowd, engaging at the bookstore event. For his part, Krishna (who has a day job under his real name, at the United Nations) talked about the need for ever-improved communications so that people around the world can become more engaged with, and informed about, the UN’s activities. Krishna, a Canadian citizen, is an award-winning former writer on “Sesame Street” who contributed over 80 quirkily engaging cartoons to UNtold. At the launch, he urged the creation of a world-wide people’s movement that would unite around the values and principles on which the UN is built, particularly those specified in the Universal Declaration on Human Rights and more recently in the “Sustainable Development Goals” that the UN adopted in 2015. Definitely, go and watch the archived, hour-long video of the event if you want to learn more about how the UN works (and too often, doesn’t work), why that is so, and how its performance can be improved. Better yet, please consider inviting Williams to come and speak to audiences or classes in your home community. To schedule an event with him, please contact JWE’s Outreach Director, Steve Fake. 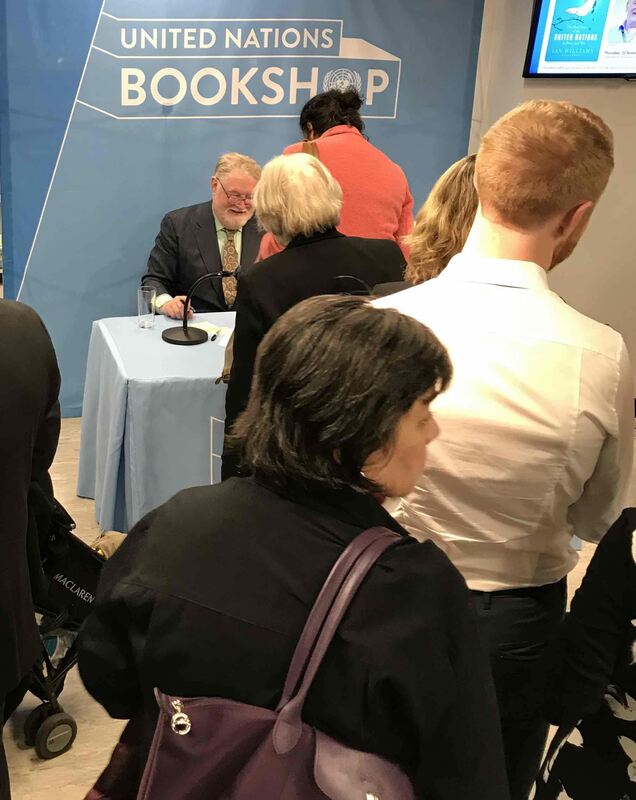 Afterwards, people lined up eagerly to their copies of the book signed by both contributors– and the UN Bookstore sold out of copies! Three hours later, Williams and Krishna were in the UN Correspondents’ Association (UNCA) lounge, for the slightly different event hosted by UNCA. At this one, veteran AP correspondent Edith Lederer presided, as shown in the photo at the head of this blog post. 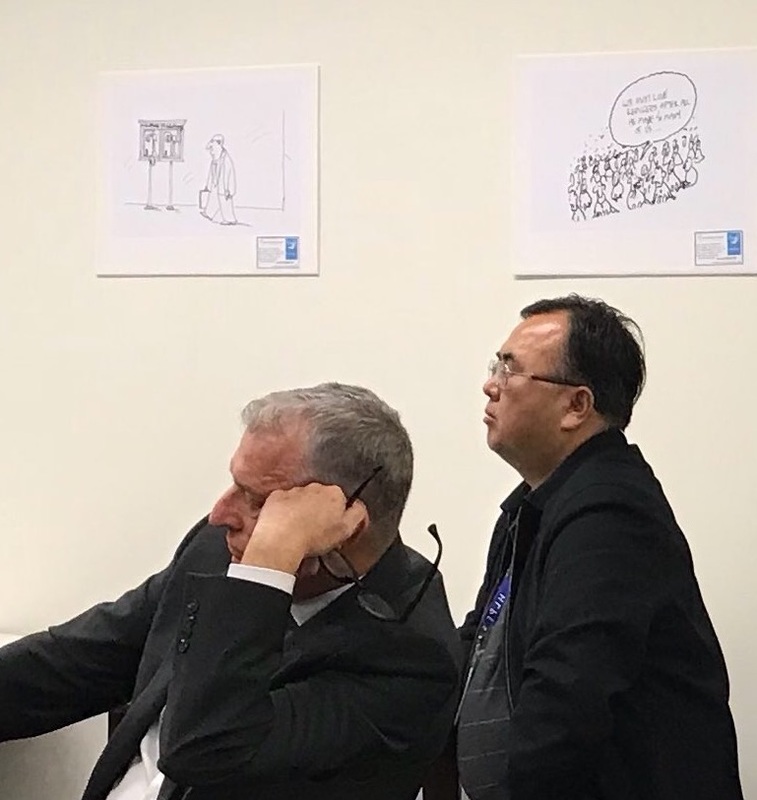 Also, for this event, Just World Ed had enlarged 14 of the wonderful cartoons that Krishna drew for the book, and these were hung on the walls to make an intriguing pop-up exhibition. Two UN-based newshounds and two of Krishna’s cartoons. Krishna and Williams both believe that humor, cartoons, and good story-telling can help to bring to broad publics the information they need if they (we) are to start holding our governments accountable for the actions they take in the world body. We agree!